We are a leading Manufacturer of microprocessor karl fisher titrimeter and microprocessor karl fisher from Panchkula, India. 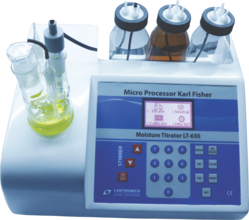 Microprocessor Karl Fischer Titrimeter apparatus is designed for determination of moisture content in solid/liquid samples. Moisture of sample is titrated with Karl Fischer reagent which is added precisely by a motorized pumping system. MICROPROCESSOR K.F. MOISTURE TITRATOR (GRAPHICAL DISPLAY) with built in magnetic stirrer, Auto computation of moisture in ppm %age and mg H2O., Simultaneous display if results in all three units, 1000 sample storage facility with batch No. Final results are flashed on 128 X 64 premium graphical LCD. Icon based Menu for easy navigation. K.F. reagent dispensing by motorized process. Highly accurate & Reliable.